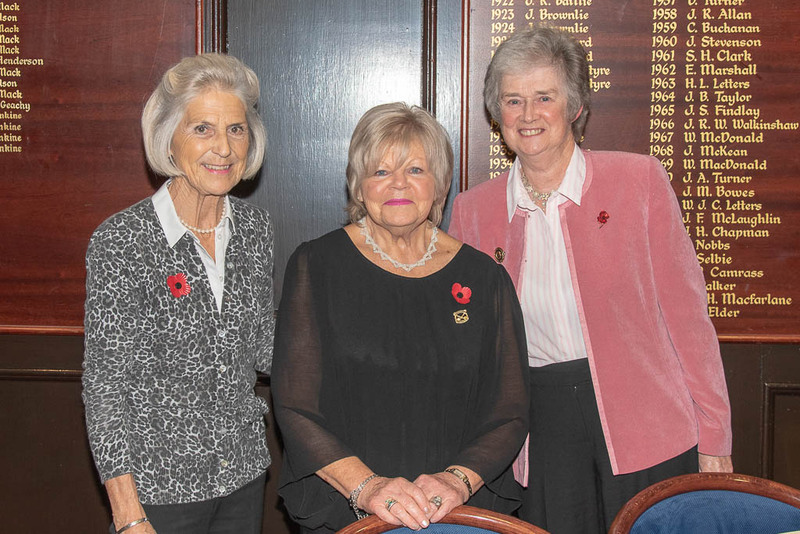 Captain June Lockhart welcomed Honorary Life President Wendy Cameron, Honorary President Jennifer Mack and all the committee and members to the AGM. She opened by saying "We thank you for such a large turn out, as it has been a very successful year for the County" She then said "I would like to record our sadness at the sudden death in March of Whitecraigs Professional Alastair Forrow, who was always keen to help the County. However on a happier note, I have to inform you of the incredible progress made by Heather Anderson of Caldwell. After 8 and ½ months in hospital with no improvement in sight, she returned home and through the efforts of her daughter Lesley, she has visited friends at Troon Portland and even travelled to Ireland. The minutes of the meeting held on November, 2017, had already been distributed and also on the website. They were taken as read and were proposed and seconded. There was one matter arising - Last year, Captain Gillian intimated the passing of Anne Morgan of Whitecraigs GC in July 2017, a Past Captain, Player and Hon. President of the County. However, Past Captain Christeen Finlayson would like me to mention her formerly as Anne MacLeod, as more members would recognise that name. - She thanked Christeen for this. 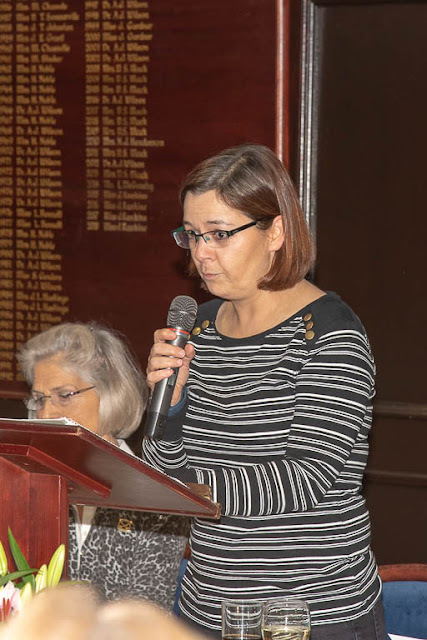 TREASURER REPORT -- Tracy Masterton The full Treasurers report will be available in the 2018 AGM minutes. However one of the main points were that fund raising will still need to continue and there will be no subsidy from Scottish Golf for the County Final to all Counties. She said what an enjoyable year it had been for her as Renfrewshire Ladies Secretary and was delighted to have met and got to know even more members this year. Our membership seems quite solid with 216 members of which 21 are juniors at close of this season. We have received 2 resignations, however, delighted to report 8 new members. This keeps our figures relatively comparable to last year. She then read out out the prizewinners this year -- CLICK HERE and congratulated all the prizewinners and said a couple of the medals had clashed with other events. She then announced the courses for 2019 which are all the fixture cards which are available for up lift this evening and asked for someone from each club to take away their clubs allocation this evening. We shall again have evening reservations at our Spring Meeting; June and July medals. She also announced that in 2020 Pollok will host the Scottish Senior Women’s Open Championship. This will be the first time in over 20 years this prestigious event comes to Renfrewshire. Scottish Golf over the past year has put a strenuous effort in trying to make the establishment more transparent and indeed more approachable. To that end, earlier this year four regional working group forums were established: North/South/East/West. These forums are made up of a variety of people: Areas and Counties Representatives; Club Managers and Council Courses personnel. Truly a mixed bag. There has so far been two meetings for each region of which I have attended both West meetings in order to represent Renfrewshire Ladies. To be honest, it is probably more worthwhile for the club representatives to attend as it is useful as a sharing platform, however, it is always useful for our County to be seen and indeed heard when required! I would like to update you on the progress of the rating of courses in Renfrewshire during 2018. Marilyn Muir and myself along with the Renfrewshire Men’s team have managed to rate 6 courses this year ----- Mearns Castle, Mar Hall, Kilmacolm, Haggs Castle, Douglas Park and Clober. 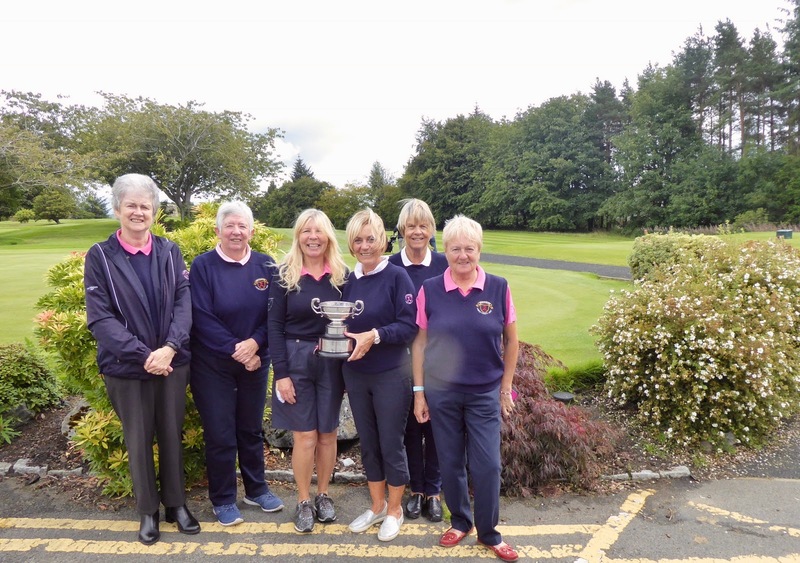 As I reported last year, 3 ladies from East Renfrewshire – Linda Ellery, Carole Spy and Elizabeth Munro – have formed a second Renfrewshire team and have successfully rated another 5 courses ----- Bishopbriggs, Sandyhills, Cawder, Cawder Keir and Milngavie. 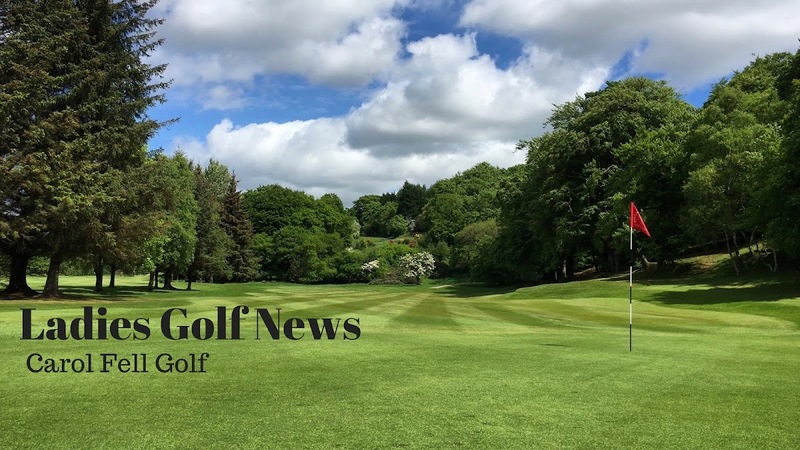 Altogether 11 courses – not as many as we might have wished but, believe it or not, we could not rate during the lovely sunny spell as the grass and rough were not growing normally and they do affect rating. I could see some of you thinking that several of these courses are not actually in Renfrewshire and you are correct. However Glasgow and several other Counties do not have any lady raters, so our teams have been involved in these other courses. Unfortunately, Scottish Golf is not planning any more Rating Seminars as next year’s seminars will be looking at the new Golf Rules and World Wide Handicapping. However, it would be great if we could get a team together from D & A so if any of you could persuade any friends from other courses to volunteer, please ask them to contact me. Renfrewshire is still one of the best counties in Scotland for being up to date with its rating programme and on behalf of Scottish Golf Ltd. I would like to say a big thank you to the ladies who give up a lot of their time to ensure that our Standard Scratch Scores are kept successfully up to date and therefore handicapping is kept accurate. 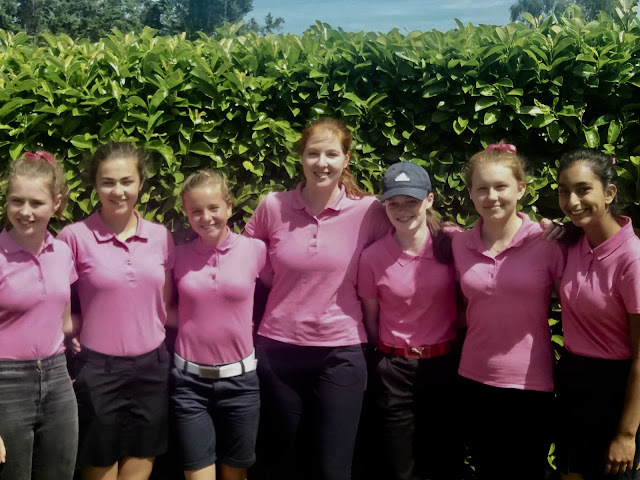 The Junior convenors of most of our clubs met at the end of last November to discuss girls’ golf. It was reassuring to learn that we all have similar issues- Lots of girls are having lessons and having fun playing a few holes but not quite committing to gaining a handicap but it’s a slow process and we need to have patience. We don’t want to put them off. 12 girls with handicaps ranging from 11-36 were invited to take part in winter coaching in early 2018. This included 7x 1.5hour sessions with Karyn Burns at the Glasgow Indoor Golf Centre plus 2 joint sessions with the seniors. This all proved very successful as the girls really began to get to know each other well which was great to see. We charged each girl £30 and the rest was subsidised by Scottish Golf. Our opponents in our matches this year were D&A but unfortunately they were struggling for numbers so we had a mini match with 7 Renfrewshire and 3 D&A girls with the younger girls playing Greensomes at Caldwell GC. My thanks go to Liz Hale for helping on the day. Unfortunately their numbers did not improve and we didn’t have a return away match in the autumn. Several girls have played the West Girls medals and matches. - Orla Rooney from Cowglen won 2nd bronze at Glasgow Gailes, 2nd silver at Troon Portland and 1st silver at Milngavie and Paisley. She qualified for their Championship but lost to Lorna McClymont, the eventual winner. Jennifer Lynagh won 1st bronze at Glasgow Gailes and Paisley. Sophie Kyle, Emily Crusher and Orla played in West Girls matches during the year. Numbers are generally low in the West Girls but I feel Renfrewshire was well represented. Sophie will be the 2019 West Girls Captain. We took part in the Kennedy Salver at Hamilton GC on June 25th. Our team was Hannah Carson, Emily Crusher, Romy Erskine, Sophie Kyle, Jennifer Lynagh, Orla Rooney and Aaliyah Sandhu. The event was complicated as D&A could only field 4 players. Our girls were also disadvantaged as they have all had their handicaps reduced and were often giving many shots on an unfamiliar course. Results: Winners Lanarkshire- R up Ayrshire 3rd Renfrewshire 4th D&A 2 of our 4somes lost on the 17th and 3 of the singles were very close-1 half and 2 losses on 17th or 18th It is our turn to host the event next year and I propose to have it at East Ren on June 10th so hopefully we will have a better result there. The Junior Championship was held alongside the Campbell Clock this year as a 1 round strokeplay competition as it is increasing difficult to get the girls together! Kilmacolm, Caldwell, East Renfrewshire, Cowglen, Haggs Castle and Eastwood were all represented. 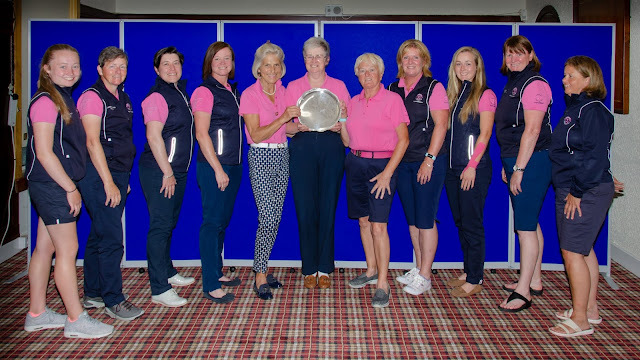 We are indebted to Whitecraigs GC for giving us the courtesy of their courses once again and to their Lady Captain, Rosemary Dobson who assisted on the day and presented some of the prizes. All the helpers were very much appreciated and delighted that they were not soaked this year. Our thanks also go to Clair Barclay who donated kindly golf balls for the goodie bags. There is no ‘Scottish Champion of Champions’ this year (junior or adult) but Romy will receive 50 points for the Girls’ OOM. The 2019 Campbell Clock will take place on Sunday August 25th, again at Whitecraigs. Orla and Jennifer represented Renfrewshire at Kingsbarns last Sunday in a Scottish Golf Girls’ initiative. 1 silver and 1 bronze player from each County could attend and the format was a better ball stableford. Orla and Jennifer were 6th on the day, although that was only 2 shots behind 2nd place. They received a coaching session from Heather Macrae and thoroughly enjoyed the whole day. Romy won the Handicap matchplay at the Scottish Girls Championships at Moray GC in July and was runner up in the Kilmacolm Ladies’ Championship. Sophie Kyle won the East Renfrewshire Ladies Championship and Jennifer Rankine - the Haggs Castle Ladies Championship. Orla has joined the SG Development Programme and Romy has a place in the Performance Academy. Looking ahead to next season: SG would like us to participate in some kind of Development coaching programme so I have met with Gillian Paton of SG then Claire-Marie Macaulay of Paisley GC to discuss winter coaching for all our Renfrewshire girls. We hope to have 4 sessions (6 hours) for 12-14 girls with handicaps at Paisley, using their new indoor facility if terrible weather. SG have suggested a charge of £30/head so I feel I need to offer more than the 4 sessions at Paisley for that price. The new facilities at Gourock look worth a visit and with clubs like Cowglen, Caldwell, Kilmacolm and Williamwood offering their facilities, hopefully we will be able to have 4 additional sessions. I would like to include the younger enthusiastic girls in these additional sessions too and Liz Hale, Lynda Bradley, Clair Barclay and Gill McLeod have all offered their services which is fantastic as it is great to spread the load and use different ideas and talents. I am really delighted that Clair Barclay is going to come onboard next season to assist with the juniors-especially the younger ones as this is our future. Clair herself was a keen junior just a few years ago and has a very talented 9 year old so she is the perfect person for the job. Finally. I’d like to thank everyone who supported the girls in any way last season but especially President Jennifer, Captain June and Vice Captain Sandra who attended many coaching days and other events throughout the season. The year began with County Squad Coaching at the Indoor Golf Centre at Kinning Park, with 4 sessions throughout January, February and the beginning of March. This was followed by a session at the par 3 course at Whitecraigs and finally a session at Troon Portland, all under the supervision of Karyn Burns. Unfortunately as the Indoor Centre has now closed, we are in the throes of working on a new plan for this Winter. On Sunday 4th of February, we held a most successful Beetle Drive Fundraiser at Haggs Castle G C 88 ladies participated and, along with donations, £1,503 was raised. A huge thanks to all who worked before, during and after the event, as Fiona Armour and Carol Fell captured the wonderful atmosphere through photographs and video. We shall be having another Beetle Drive here on Sunday 27th January, as fundraising will have to be an annual event for reasons to be explained later, so please keep that date free in your diaries. 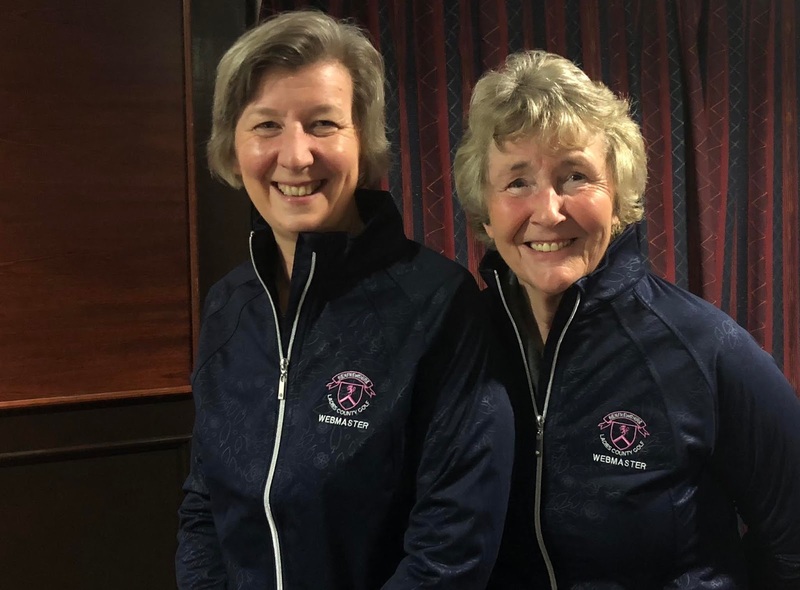 The Winter Foursomes Final took place at Elderslie GC on Easter Monday, where Alyson McGinnigle (Cowglen) and Carol McNally (Williamwood) won 3 & 2 over East Renfrewshire pairing of Linda Ellery and Elizabeth Munro. The conditions were Baltic, so everyone deserved a medal. 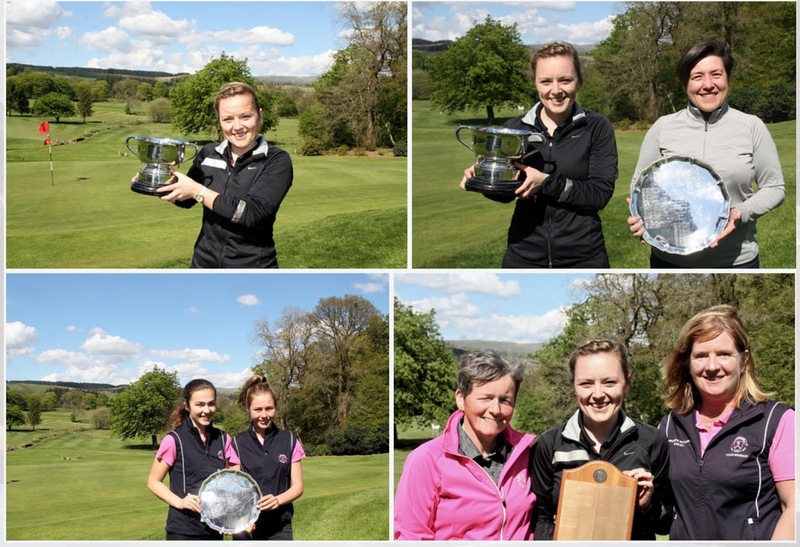 The Championship in April at Haggs Castle GC saw 58 ladies play the medal round despite the very harsh overhead and underfoot conditions – again a great credit to all. 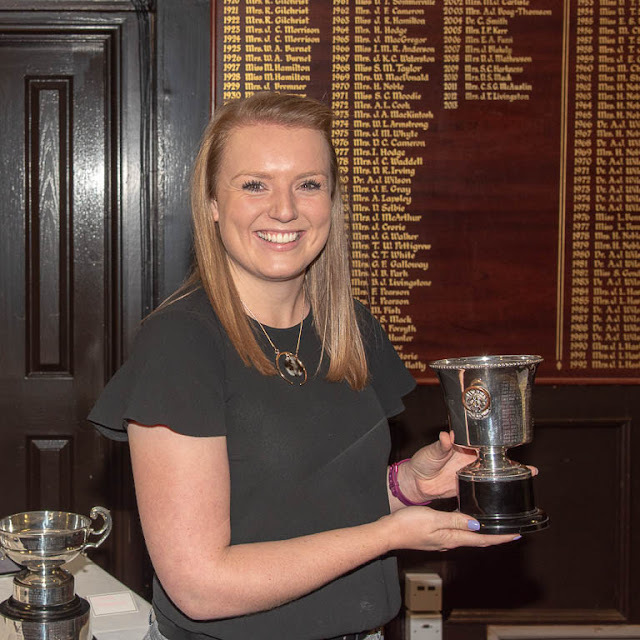 Eilidh Briggs (Kilmacolm) scored an unbelievable gross 71 and also retained the Peggy Clark Trophy for the best nett score. Eilidh went on to win the Championship Final, but Gillian Kyle (East Renfrewshire) pushed her hard in the front nine, where both had several birdies. However Eilidh pulled away in the second nine to win 4 & 3. Winner of the Handicap Final for the Irvine Trophy was Jan McNab (Ranfurly Castle) who beat Morag Little (Whitecraigs) in an exciting game, which finished on the 18th green. We were hugely indebted to Haggs Gents Niall Stewart and George Crawford for their help over the 3 days, and to Sandra Littlejohn for organising the event. Later that month, the County had great success at the West of Scotland Championship at Balmore GC, where Megan Briggs won the Championship for the 5th time, with the Handicap Salver being retained by Alyson McGinnigle. However as Alyson had won a scratch prize by coming 3rd, Renfrewshire's Junior Emily Crusher won the Handicap Voucher as she was 2nd to Alyson, which was a great achievement. One thing to mention is that next year's Championship handicap limit will increase to 20, in order to increase more entries, especially Juniors. In mid June, we hosted the West Jamboree at Erskine. The team consisted of Jennifer Rankine, Donna Jackson, Gillian Kyle, Liz Stewart, Alyson McGinnigle, Carol Whyte, Julie Wilson and Emma Kennedy. They put in a tremendous performance over the 3 days where the Match v Lanarkshire was halved on Day 1, they beat D & A 6-3 on Day 2 and on Day 3 we beat Ayrshire 5-4 in a thrilling finish, where it was only decided on the 17th green in the last match. I cannot speak highly enough of the team's efforts and their team spirit, although Sandra and I would never have gone near a blood pressure machine ! Finally County members turned up in large numbers to support, so Renfrewshire really showed its true colours, so we thank you all. Captain June then presented an "injured" Emma Kennedy with her team badge for playing for the county for the first time and wished her a speedy recovery after her recent foot operation. In early September, Alyson McGinnigle (Cowglen) and Carol McNally (Williamwood) won the Commonwealth Spoons at Stirling GC by an incredible margin of 9 strokes, scoring a total of 69.5. Now the County Finals at Kilmacolm GC. The team was Eilidh Briggs, Megan Briggs, Jennifer Rankine, Gillian Kyle, Donna Jackson, Liz Stewart, Alyson McGinnigle and Emma Kennedy, with Carol Whyte as Reserve. In the weeks leading up to the event, Emma sustained a foot injury which meant she had to withdraw, and she has since had an operation to rectify the problem, so we wish her all the best in her recuperation. However Carol came to the rescue to fill in, and the team contested the Finals with a full squad and Julie Wilson acting as Reserve. On Day 1 v Midlothian, after losing the Foursomes, the team rallied to win the Singles 5-1 to win the Match 5.5 to 3.5. On Day 2, the team beat Dumfriesshire 6.5 to 2.5 so setting up an exciting Day 3 v a very strong Aberdeenshire team. After losing the Foursomes in the morning, they fought back in the Singles, where some incredible golf was played. However this time they couldn't quite pull it off, and lost by an agonising half a point on countback, though we did win the Trophy for coming 2nd. Despite the disappointment, the team took defeat with very good grace and indeed showed their appreciation of an Aberdeenshire team which hadn't won the title for 34 years. 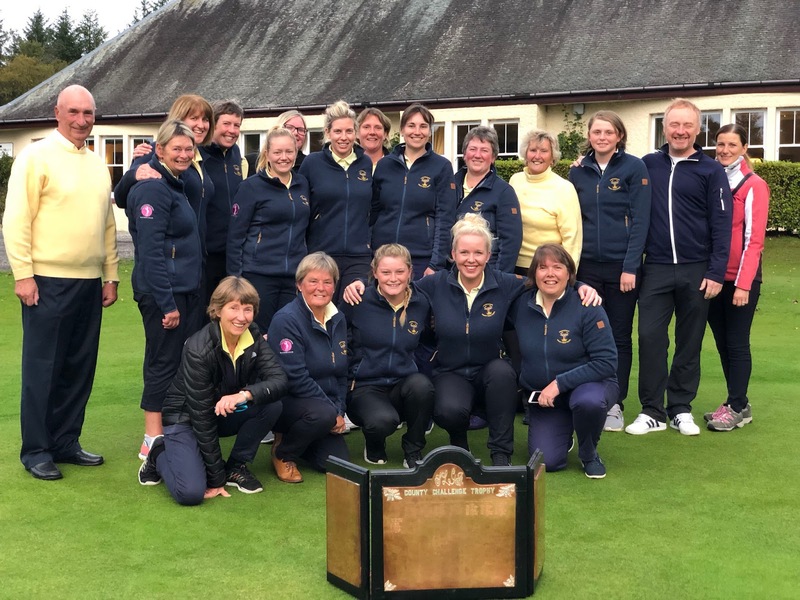 I met up with Ann Smart, Captain of Aberdeenshire, on visiting Aberdeen at the weekend, and she reported that everyone from their area (players, officials and supporters) were bowled over by how well the Finals were run, so take a bow Kilmacolm GC. 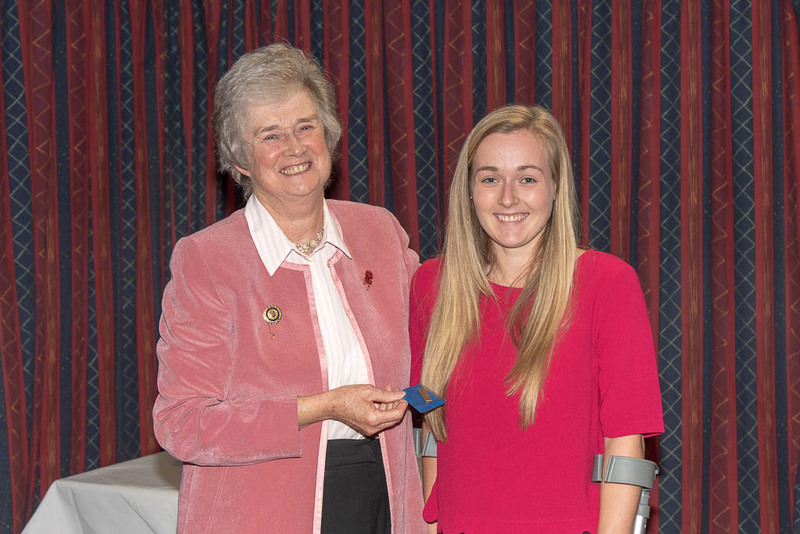 Eilidh Briggs – In early April, she won the Whittington Trophy at Whittington Heath GC by 3 strokes after finishing 9th the week before at Delamere GC – both prestigious English Amateur Events, as well as finishing 13th at the Irish Womens Amateur Open. Following that she won the County Championships here at Haggs Castle. Jennifer Rankine – In April, Jennifer was in the U18 Scottish Squad and had a hole-in-one at the Irish Under 18 Girls Open (on Friday 13th ! ), and was part of the Scottish Girls Team which played in the European Team Championship in Sweden. She was in the Stirling University Scholarship Team which took part in the Slovenian Ladies Amateur Open, and came 4th in the Stephen Gallacher Golf Foundation Trophy at Cardrona GC. 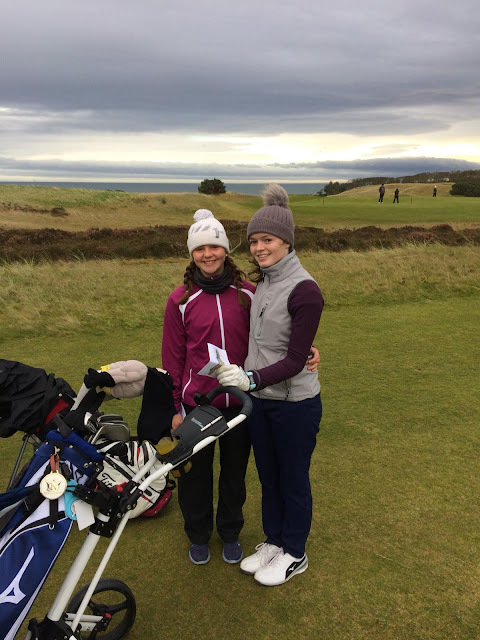 She also played for the Scottish Girls Team in the Home Internationals at Ballybunion, and although they finished 4th, Jennifer won 2 and a half points out of 4. 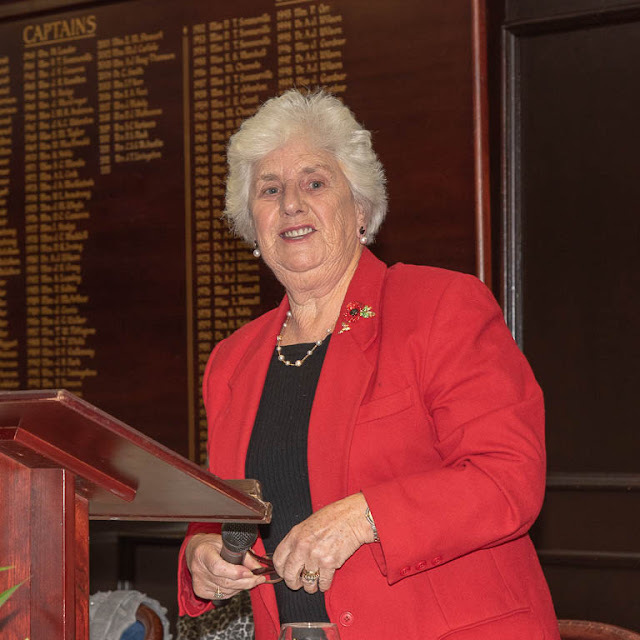 Gillian Kyle – In March, she was given Honorary Membership of East Renfrewshire GC, and in April she played for the Scottish Vets in the Mary McKenna Trophy in Ireland and in the Vets Jamboree at Hexham in August. 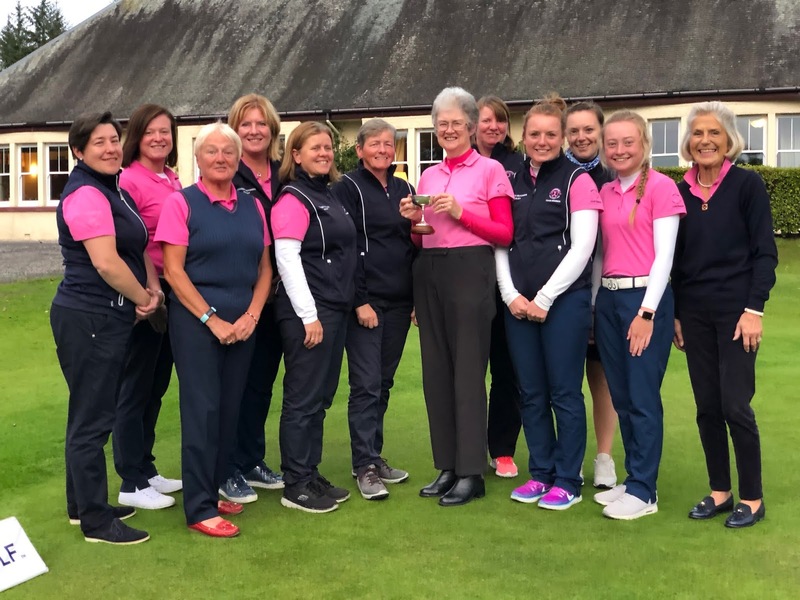 She also played in the Scottish Seniors Team at the European Team Championships in Belgium in September, and in the Home Internationals in October at Burnham and Barrow GC. Liz Stewart was Runner-Up in the West Vets Championship Final, and played for the Scottish Vets in the Jamboree at Hexham. Megan Briggs won the West of Scotland Championship for the 5th time at Balmore GC and we congratulate her on her recent marriage to Iain Scolefield. At the Scottish Championships at Elie, Jennifer Rankine qualified after 2 rounds but was narrowly defeated in the 1st round of Matchplay. Gillian Kyle and Emma Kennedy were also narrowly defeated in the 1st round of Matchplay for the Clark Trophy. 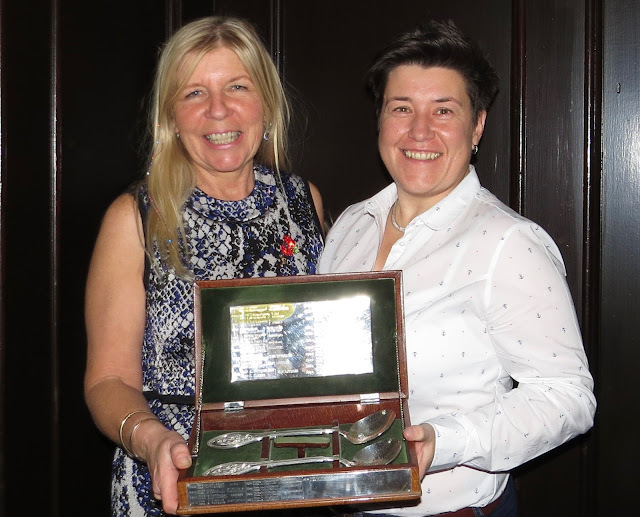 After a very successful season, Alyson McGinnigle was awarded the prestigious Jack Murray Trophy at Cowglen GC, a Trophy rarely awarded to a lady golfer. 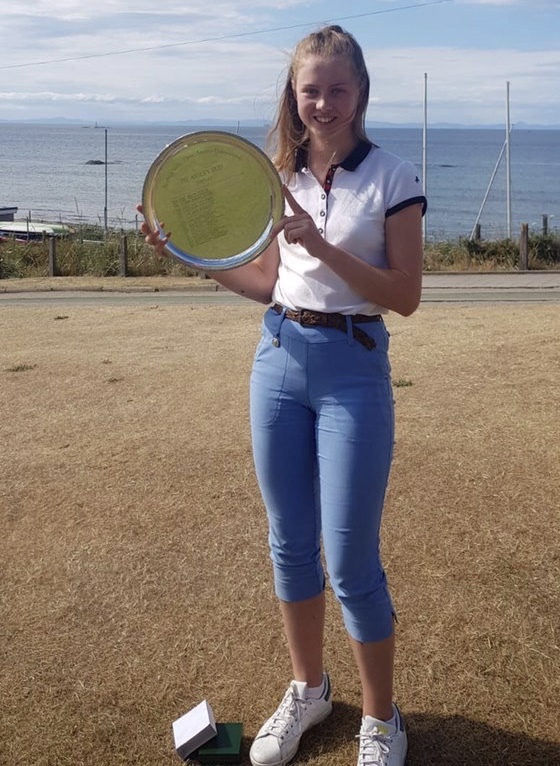 Although mentioned in Gillian's Junior Report, I must also congratulate Romy Erskine for having such a superb season by winning the U 18 Scottish Handicap Championship, and reducing her handicap from 11 to 5 in the month of July. She also came a gallant 2nd to Megan in the Kilmacolm Championship. Mention has to be made of Maureen Woodhead (Gourock GC). A Past Captain and Team player for Renfrewshire, she won the Gourock Championship for the 25th time. We may not see her much in the future as she moves to a new base in the Lake District with husband Neil, so we wish her all the best. Now, on behalf of the County, I would like to thank all the courses which have granted us courtesy for all Competitions and Matches throughout the season. We certainly do appreciate it, and that is why we encourage players to partake of the Catering in order to support the Clubs. We're delighted to say that Wendy Cameron continues as our Honorary Life President, so we thank her for that. Although being the Instigator of reducing the President's term of office from 5 to 3 years, Jennifer Mack agreed to stay on an extra year in light of us hosting the Jamboree. Jennifer has been a tremendous support to both Gillian and myself, and her entertainment value at Social Events can never be matched. So on leaving office, we would like to present her with this gift of a collection of photos from the website. 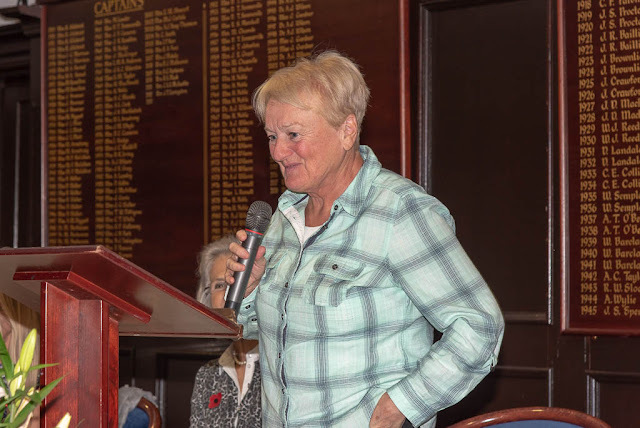 After playing with Eileen Gibb at Paisley Golf Club she was asked to play in a bounce game with Donna Jackson and that led her to be invited to join Renfrewshire County and being a good friend of Donna whom she has caddied for over the years at numerous events. For many years afterwards was the most dedicated caddy for Renfrewshire. She and husband Johnny have been ever present supporters at Jamborees and County Finals, and I am of course referring to Pearl Orr. 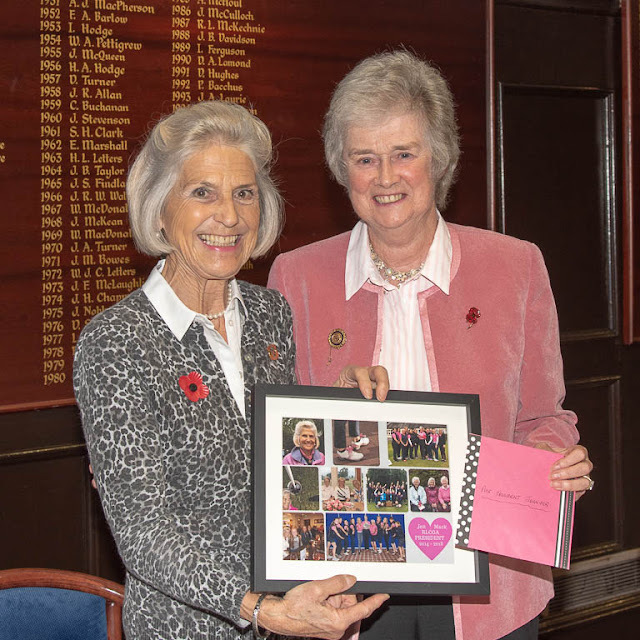 We're delighted to say that both Carol McNally and Tracy Masterton are continuing as Honorary Secretary and Honorary Treasurer respectively, and as always we thank them for their work. Gillian Kyle will continue as Junior Convenor as well as Child Protection Officer. She has done a great job in building up a core of Juniors, so we are really indebted to her for that. Sandra Macdougall will continue as Membership Secretary, and Fiona Armour, although technically off Committee, will continue as Results Secretary. Linda Ellery is due to come off Committee, but will continue to be our 'Clothing Saleswoman'. She has been most competent and conscientious, and we can't but thank her for her hard work. Apart from items being displayed at the most important meetings, the range can be viewed on the website. Liz Stewart and Marilyn Muir have another year each, so that leaves 2 places to be filled. 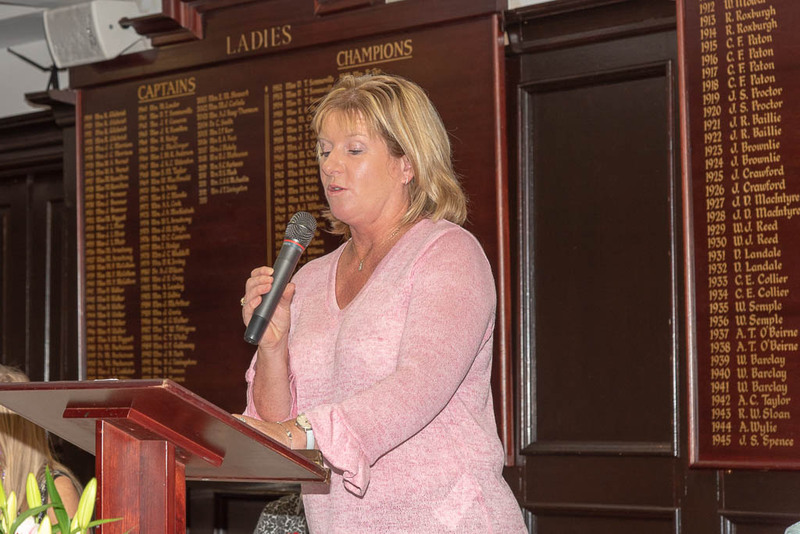 I would like to propose Julie Wilson (Williamwood) and Elaine Munn (East Renfrewshire) Now it has been agreed that Julie Wilson is elected, she must be the quickest on record to be given a job – she has agreed to to be responsible for accepting Winter Foursomes Results !! Last November, Sandra and I attended a SG Meeting at Stirling, where we chose the 1st of 2 dates offered. This went reasonably well despite some gentlemen being controversial, and with their emails afterwards. Apparently at the other Meeting, the fur was flying, so we dodged that experience ! In December, we attended the Day Conference in Edinburgh, where Stewart Darling painted a gloomy picture if we did nothing in golf. This can still be seen on the website, so I strongly recommend you listen to it. In February the Committee met up with Eleanor Cannon, where she certainly answered all our questions about the affiliation fee increase and the amalgamation topic. In March we attended the SG AGM at Dalmahoy, where the affiliation fee increase was rejected. It transpired that 1 or 2 Areas had enforced their Constitution Articles where Proxy votes determined how their 10 votes should be cast, despite those present wishing to vote for the increase. In May, I attended a Meeting at Auchterarder for Counties only, and the day after the Jamboree, Sandra and I were invited by Derek McGlynn (Renfrewshire President) to meet up with all Area Club Reps to meet with the new CEO for SG, Andrew McKinlay, who certainly seemed less dictatorial and more willing to listen than the previous CEO, Blane Dodds. 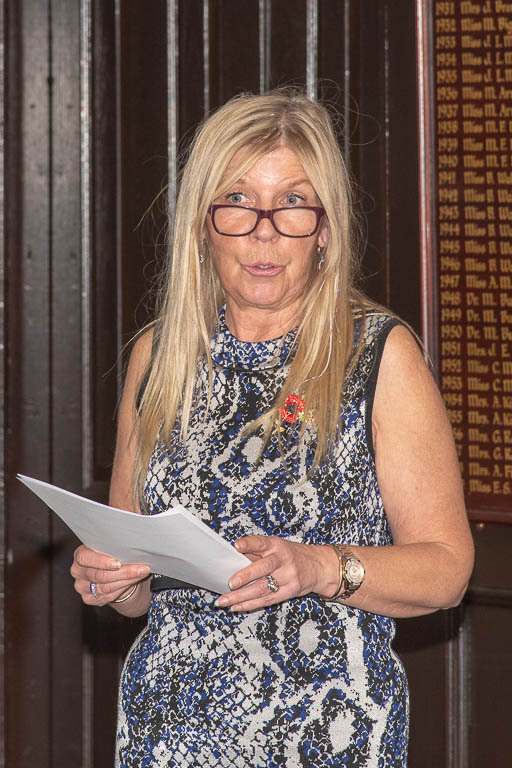 Finally Sandra attended the General Meeting on the 4th of October to revisit the affiliation fee increase, and this was eventually passed, with a majority vote of 60.2%. As I was returning from holiday that day, we couldn't risk registering me to vote, in case of a late flight. The main points of all these Meetings were as follows. SG has no legal influence on Areas/Counties re. Amalgamation. Only 1 County so far has amalgamated (N. Counties) as they gained far more money by making every lady golfer pay a small fee. However Renfrewshire would gain less than ½ what we collect as subscriptions, as is the case with several other Counties. At the AGM in March, Eleanor Cannon admitted that such amalgamation is not feasible or desired by most Counties. Although this issue seems to have been put to bed, it is possible that some sort of change may come about in the roles of the Areas/Counties, but that is no time soon. 4 Regional Forums have been set up (N,S,E & W) where volunteers from Clubs, Areas & Counties meet up every few months, and our Representative is Carol McNally. This is primarily to answer the criticism that since SLGA/SGU Amalgamation, there have been few occasions for people to meet with SG. Also it allows examples of best practice to be aired. After County Committee discussion on 2 occasions, we unanimously voted to back the increase in Affiliation Fee from £11.25 to £14.50 which will take effect from Jan. 2019 and will be frozen till 2022. We also agreed to support the calling of the GM in October to revisit this. One aim of SG is to look at the anomaly of Counties each having 10 votes, as it means Counties have 22% voting power but only 10-13% of lady club golfers. In the future, they wish to aim for 1 member 1 vote. It may be that Training Grants will be appreciably curtailed and the County Finalists will not receive any contribution towards expenses. SG has 3 main aims for the future – to increase membership by 20% (especially women and juniors), work on more sponsorship and to tackle contribution by nomadic golfers. 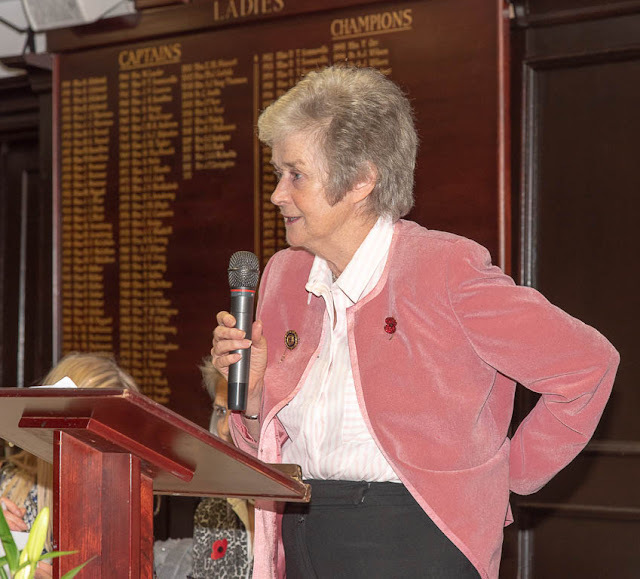 Vice Captain Sandra Littlejohn then took over and said as June had already mentioned in point 1 above the only county to amalgamate was Northern Counties and no other are, counties had amalgamated. By making every lady golfer pay a small fee works for Northern Counties but Renfrewshire, however would gain less than half of what we currently collect if we went down a similar path as is the case with several other counties. As you can imagine, the subject of more inclusiveness amongst lady golfers and county golf was raised and discussed during all the various debates regarding amalgamation..
With this in mind, Renfrewshire Ladies County Golf Association is now seeking for your approval to increase our entry handicap limit from 24 to 30 and thereby making county golf assessable to more lady golfers. The increase does not affect the CSS. as it currently stands category 4 goes up to 28 and category 5 from 29 - 36. The number of Category 5 players and their scores are not counted when working out the percentage in their buffer zone. For your information - Ayrshire, D&A plus Lanarkshire have all at recent AGM's increased their entry limit to 32, 30 and 32 respectively. The Beetle Drive has been booked for Sunday, 27th January 2019 and the Biennial Dinner on Thursday 21st March – both events here at Haggs Castle GC. I have already organised a speaker and a little entertainment for the Dinner, so it would be great to have a good turnout for both events. The meeting finished with the presentation of Prizes by Jennifer Mack the outgoing President. A final presentation was made to delighted Webmasters / Photographers Carol Fell and Fiona Armour for all their hard work with the new RLCGA Website which was intimated earlier still had problems but hopefully over the winter can be resolved. Finally a Vote of Thanks was given by County Champion Eilidh Briggs.